JAMESTOWN – Long-time local attorney Fred Larson will become the second city judge of Jamestown. Mayor Sam Teresi announced Larson as his selection during Monday’s Jamestown City Council voting session, saying that considering there were a number of qualified candidates for the position, it was very difficult decision for him to make. 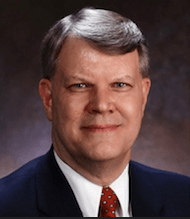 However, he said that given Larson’s experience and record as a long-time local attorney, he felt that Larson was the best qualified candidate for the job. The City Council Monday night approved the appointment of Larson by a vote of 8 to 1, with councilman Brent Sheldon voting against appointment, saying he felt the judge should be selected via local election, not through mayoral appointment. However, following the meeting Teresi explained that under guidelines of the legislation establishing the position, it was intended to be filled via appointment and not through election. He also said that it was imperative the city act as quickly as possible to fill the seat and get a second judge on the bench, adding that any challenge to the appointment process would only create a further backlog of cases. Larson currently sits on Jamestown Board of Public Utilities, the Chautauqua County Legislature, the County Airport Commission and the County Land Bank Corporation.He will have to step down from those positions prior to taking the bench. In the past he’s also served as Jamestown City Councilman, County Attorney and member of the Southern Tier West Railroad Authority. Larson – who will turn 63 in November of this year – is a Jamestown native and a law graduate of Yale University. He received his undergraduate degree in public and international affairs from Princeton University. He’s practiced law in the Jamestown area since 1977. He joins judge John LaMancuson as the city’s second judge. His term will last 10 years and will expire in 2024.